Archbishop Mar Jacob Thoomkuzhy was born at Vilakumadam in the Eparchy of Palai on 13th December, 1930. At present his family belongs to Sacred Heart parish, Thiruvambady in the Eparchy of Thamarassery. He had his priestly studies at St. Joseph’s Pontifical seminary, Aluva and Urban College, Rome. He was ordained priest on 22nd December 1956 in Rome. After the ordination he continued his studies there and took Doctorate in Canon and Civil laws from the Lateran University, Rome. On coming back he was appointed secretary of Mar Sebastian Vallopilly, the then Bishop of Thalassery, and chancellor of the Eparchy. Later he was appointed Rector of the Eparchial Minor Seminary at Thalassery. After a few years he resumed his studies at Fordham university New York from where he holds a Master’s degree in English Literature. Soon after his return from the States he was again appointed Rector of the Eparchial Minor Seminary, Thalassery and worked there till his nomination as the first Bishop of the newly erected Eparchy of Manathavady in 1973. He was consecrated on 1st May, 1973 by the late mar Joseph Cardinal Parekattil assisted by the late Mar Sebastian Vayalil and Sebastian Vallopilly. He took charge of the Eparchy on the same day. He served the Eparchy of Manathavady for 22 years. 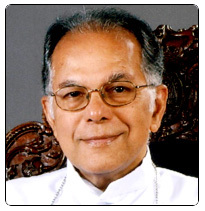 On 7th June, 1995 he was transferred as the Bishop of Thamarassery and took charge of his office on 28th July 1995. On 18th December 1996 he was again transferred as the Archbishop of Trichur and installed on 15th February 1997. Marymatha Major Seminary, Jeeven T.V., Jyothi Engineering College, Mahajubilee Training College (B.Ed. College), Jubilee Mission Medical College and Teachers Training Institute, Etc. are some of his pioneering contribution to the Catholic Church and Society. He is the first President of CBCI. His motto is “Until Christ is formed in you”. The resignation of Mar Jacob Thoomkuzhy from office as the Metropolitan Archbishop of Trichur submitted to the Major Archbishop on reaching 75 years of age became effective on 18 March 2007 when Mar Andrews Thazhath was enthroned as the new Metropolitan Archbishop of Trichur.